Language Almost all Boholanos can speak and write the English language. Topography Varies from level to steeply sloping, with land elevation ranging from 0 near 900 meters above sea level. I am checking business feasibility in some municipalities in Bohol. Do you have a more current Quick Facts Data? Thanks! Please refer to the website of Bohol Investment Promotion Center (BIPC) website. 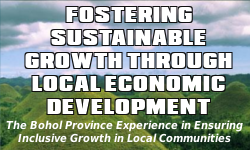 They have a more current data on Economic Indicators and the Cost of Doing Business in Bohol. BIPC will gladly assist potential investors and enterprises.